Why in the world would anyone believe in all this Singularity nonsense? If you have your doubts about the exponential growth of technology continuing indefinitely, there’s a guy you should talk to: Ray Kurzweil. The author of the Singularity is Near, subject of the film Transcendent Man, and inventor of reading machines and the digital synthesizer, Kurzweil is one of the key figures at the center of the debate on how technology will grow in this century and beyond. His key argument, that information technology (and intelligence) obeys a law of accelerating returns, has helped him predict major paradigms in IT in the last 25 years. 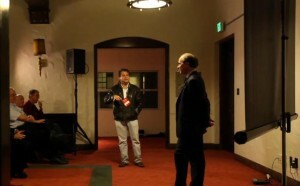 Peter Diamandis (left) and Ray Kurzweil (right) discuss how Singularity University and the Executive Program were just concepts but a year ago. Kurzweil is one of the founders of Singularity University and was an obvious choice to give the keynote address at the opening of SU’s nine day executive program. While that program is just now winding down, the release of videos documenting it is just getting started. Watch Kurzweil make the case for the exponential growth of IT and explain how it could affect us all in the video after the break. Don’t have time to watch a 40 minute video? We’ve got a handy highlight reel for you below. 4:40 – The exponential growth of IT: Intelligence s the ability to predict the future so we are all in the prediction business. 11:00 – Technology growth is predictable even if what we do with technology is not. 13:00 – There is a profound difference between linear and exponential growth. 15:00 – Slides begin! While some of these slides will be familiar to some, they have been updated with new data. 17:11 – Information technology is democratizing. 22:43 – As a field experiences exponential growth we tend to invest in it, thus leading to the ‘double exponential growth’ graph. 24:10 – IT growth seems to be unaffected by economic fluctuations. 27:10 – Graph of the total bits shipped. This growth is driving the economy. 38:08 – Photovoltaic production: We have more than enough resources for our population. Stay tuned to the Hub for more news about Singularity University and videos of their unique presentations. And check out SU’s twitter feed to keep up to date on everything going on in the program.